When you look at the list of the oldest academic institutions in the world you will see that Bologna, Italy (1088) tops the list followed by Oxford, UK (1096) and then Salamanca, Spain (1134) but why isn’t China in this list? After all China had an Imperial examination system for two thousand years and it must surely have had a major academic institution to administer the system? Yes, there was indeed such an institution: the Hanlin Academy which was home to the most gifted scholars, philosophers, writers, historians and scientists. It lasted for nearly 1,200 years and so certainly outstrips any other ‘university’ in longevity. The academy began, as many great Chinese institutions did, back in the Tang dynasty. 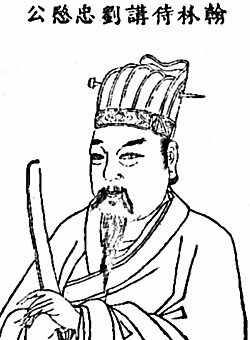 In 725CE Emperor Xuanzong founded an academy within the Imperial Palace at Chang’an (present day Xi’an). It was originally open to all kinds of expert, not just scholars, including musicians and acrobats. It prospered and in 738 it moved to a new home: the 翰林学士 Hànlín Xuéshì or 翰林院 Hànlín Yuàn. I originally assumed ‘Han’ was a nod to the Han dynasty after which many Chinese institutions are named, but in fact in this case ‘Han’ is a writing brush so the literal translation should be ‘Forest of Brushes Academy’ an apt name for an august assembly of skilled writers. 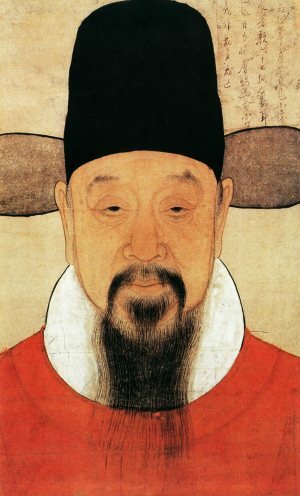 Famous academicians from the early period include the great Tang poets Bai Juyi and Su Shi (Su Dongpo). Only the brightest of students were chosen from the top 进士 jìn shì ‘Doctorate’ grade of state examinations. The primary function of the academy was to write the carefully phrased Imperial edicts but it had many other roles. On occasions academicians were called on to advise at times of crisis - such as the An Lushan rebellion (755-763) and much later over the opium problem. The Hanlin academy also provided tutors to both the Imperial family and top court eunuchs. As the top academic institution the scholars set and marked the state examination scripts - sometimes going out to the provinces to adjudicate on examination issues. Academicians were often appointed to leading roles at other academies over the country to spread the love of learning. Perhaps more importantly they recorded a contemporary account of the acts of the Emperor. This was the ‘实录 Shí lù true (or honest) record’. On the fall of a dynasty these records would form the official history of the preceding dynasty. The academy housed a magnificent library which held a prestigious collection of the finest books. Over the dynasties the role of the Hanlin academy changed. Early on Tang Emperor Shenzong purged it of diviners, physicians and chess masters. It then became a pool of top advisers (a ‘think tank’). An academician was one of very few who had direct access to the Imperial Inner Court. For many aspiring members the academy was just an important stepping stone towards being appointed to a very lucrative role as a minister in the Imperial Secretariat. Academicians also worked on commentaries of the Confucian classics but the academy was not a Confucian institute, there were also scholars of Daoism and Buddhism. However, the key benefit of the appointment was the great respect and honour that it gave the holder, in this regard it resembled the Royal Society of London (founded 1660). 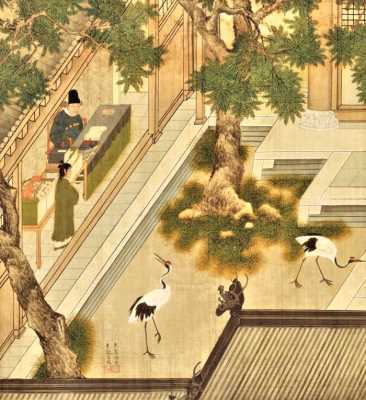 During the Song dynasty the academy lost some of its direct political influence and concentrated on cultural matters. In the following Yuan (Mongol) dynasty the famous painter of horses Zhao Mengfu ➚ became a director. The Mongol over-lords created a separate institution on similar lines to deal with all the Mongolian - Chinese translation work and let the Hanlin Academy concentrate on Han Chinese culture. When the Ming dynasty began in 1368 the academy was located at the capital Nanjing. The new Han Chinese dynasty gave the academy a much wider remit. In 1403 Emperor Yongle set the academy upon its most famous and greatest task. He ordered a great encyclopedia to be written the 文献大成 Wén xiàn dà chéng but he was disappointed by the scope of the end result - it mainly covered literature and so instigated a much grander project the 永乐大典 Yǒng lè dà diǎn. This was to be an encyclopedia of all known scholarship on all subjects arranged into categories ordered according to its special system of rhyme of category names. It took 2,180 scholars six years to produce an amazing work totaling 11,095 volumes - the Wikipedia of its day. Its content was considered so vital and significant that no foreigner was allowed to view it. Some say that a copy was buried with Emperor Yongle and may still lie there intact. Two copies of the great Yongle Dadian were made of the original at Wenyuan Ge in the Forbidden City. The copying started in 1562 and took five years to complete. 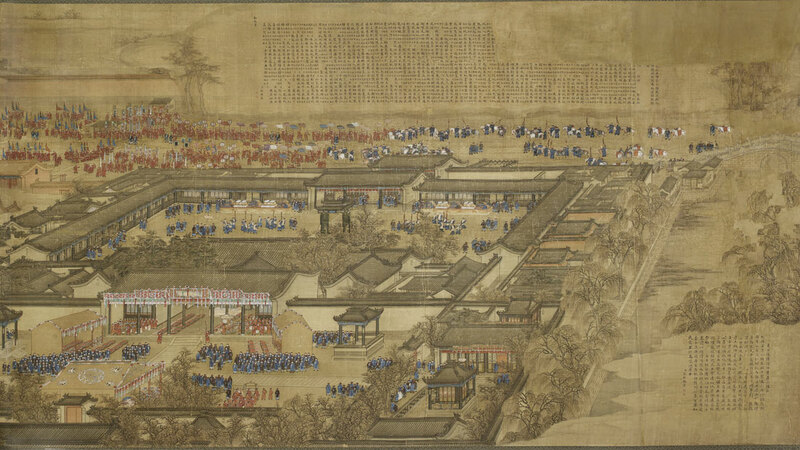 One copy remained at Nanjing and together with the original was destroyed during the Manchu conquest. The remaining copy came to the Hanlin Academy at Beijing in the 1720s. All this work on great encyclopedias took scholars away from their usual studies of the ancient classical texts and some lamented the decline in classical scholarship. When the Imperial court moved to Beijing in 1421 the academy was initially located within Forbidden City, but in 1442 it was moved outside to a former Mongol Imperial building - the 'Court of State Ceremony'. The academy was spread out over twenty separate halls and was located just to the east of present day Tiananmen Square where it remained until its closure in 1911. It entered a golden age as the Imperial institution of arts and letters. It was during the Ming (1385) that the top three candidates for jinshi examinations were granted automatic entry as academicians. This was not the end of their studies for members then faced the grueling internal examination of the Institute of Advanced Studies 庶常馆 Shù cháng guǎn, after three years of study only those who passed could stay on permanently while those who failed generally entered the Imperial Civil Service as local provincial officials. The examination focused on testing their ability in the areas of classical erudition and rhyme prose. 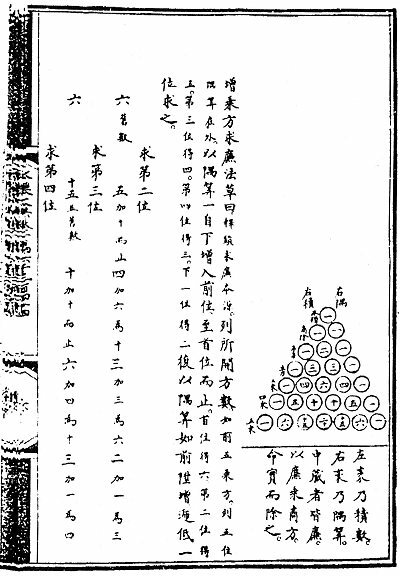 During the Jesuit mission came to Beijing in the late Ming dynasty (1607) Matteo Ricci worked with academician Xu Guangqi on a translation of Euclid’s Elements. Xu went on to become a Christian convert – one of the ‘Three Pillars of the Christian Catholic church in China’. When the Manchus came to power in 1644 they preserved the Hanlin Academy but created special entry for leading Manchu people by quota. It was necessary to train up skilled Chinese - Manchu translators and so some were admitted despite poor examination grades. In the great early phase of the Qing dynasty under Emperors Shunzhi, Kangxi, Yongzheng and Qianlong the academy prospered. Emperor Kangxi (1661-1722) became concerned over the quality of calligraphy and thought only a few of the academicians could write well. 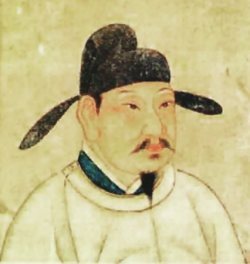 Xu Jun who became an academician in 1713 after finishing 8th in the examinations was sent down for being ‘careless in his studies’ after a few years. Not to be outdone by their Ming dynasty predecessors Emperor Qianlong set the scholars on an even bigger project than the Yongle Dadian, this was the 四库全书 Sì kù quán shū ‘Complete Library of the Four Treasuries’ - the world’s largest ever paper-based encyclopedia. It began in 1773 and took 361 scholars nine years to produce 36,381 volumes - about 800 million characters in length. Four virtually complete copies of this great work have survived to the present day. In the last phase of the Qing dynasty the famous ‘opium commissioner’ Lin Zexu ➚ came 7th out of 237 candidates to pass the jinshi examination in 1811 and entered the academy. The scholar/military leader Zeng Guofan also attended. After about 1800 it fell into decline; drinking, chess and gambling became common pursuits and many books from the great library were pilfered. Indolence set in and some posts became mere sinecures. Membership was opened up to all those who came top of the lower grade provincial examinations. 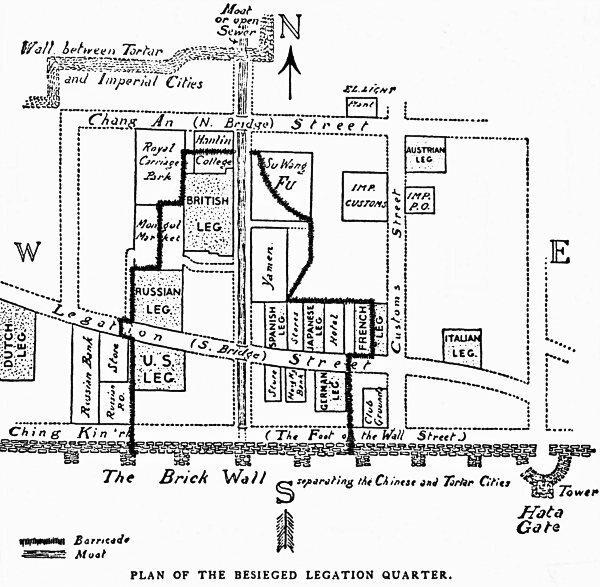 A map of the defenses of the Legation Quarter in 1900. Image by Ada Haven Mateer available under a Creative Commons License ➚ The Hanlin Academy is immediately north of the British Legacy and shows a barricade built right through it. The British have had a hand in almost any story about China from the 19th century and in this case by sheer accident were instrumental in the downfall of the academy. The British after the second Opium War (1860) had forced the Emperor to grant them a permanent embassy in Beijing. They were allocated the 梁公府 Liáng gōng fǔ building just south of the Hanlin Academy. When the Boxers began the ‘Siege of the Legations ➚’ in 1900 the academy became a key point on the border of the legation quarter. As the academy and legations contained many wooden buildings the Boxers decided that a fire would breach the defences and so on 23rd June 1900 the academy was deliberately set alight. The besieged foreigners worked frantically to prevent the fire spreading into the legation and chopped down trees and demolished buildings to create a fire break. They successfully held back the fire but only at the cost of great damage to the academy. The Chinese attackers had moved out many books but the remnants of the great Yongle Dadian had been left (in any case it is estimated only 5% of the encyclopedia remained in good condition at this time). The academy was then looted. George Ernest Morrison ➚, the Times correspondent, took part in the proceedings. Lancelot Giles, son of Cambridge sinologist Herbert Giles ➚, also present at the siege brought back one volume of the great Yongle encyclopedia to Cambridge University Library where it still remains. Currently 432 of the 11,095 volumes are known to survive and are spread between universities and libraries over the world. 84 other large volumes comprising the dynastic records of Ming dynasty found their way to Cambridge. Only one hall of the Academy, containing stone tablets, survived the inferno. As a bastion of the Imperial system it would have needed drastic overhaul for the Hanlin Academy to survive the foundation of the Republic of China in 1911. No attempt was made, instead the modern universities of Peking University (1898), Fudan University (1905), Tsinghua University (1911) and the University of Hong Kong (1911), sprang up to take up the reins from their most illustrious forbear. Citation information for this page : Chinasage, 'Hanlin Academy - Forest of Brushes', last updated 27 Jun 2018, Web, http://www.chinasage.info/hanlin.htm.